Those of you who, like me, are fanfic writers may often have dreamed of getting your works published in print—getting acclaim from wider audiences, perhaps even making a little bit of money, too. Of course, for most it’s an impossible dream. There are very few writers or media entities who are friendly enough to fanfic to publish or even look at fan-written stories (by and large with good legal reason)—and print-publishing it illegitimately is tantamount to waving a red flag in front of a legal bull the approximate size of a wooly mammoth. Of course, that doesn’t stop some people from trying it anyway. But the remarkable thing in this case is not that the fanfic got published—it’s how it got published, and to what extent. We start with fan author Lori Jareo, who wrote a lengthy novel-length epic work called Another Hope [Google cache link, will expire within a few days] set in the Star Wars universe. I haven’t actually read the work in question (nor do I have any desire to), but apparently it belongs to the sub-genre of fanfic called “What-If?”—taking an existing story and changing some plot details to see how it plays out. And as fanfic goes, there’s nothing wrong with that; some of the best fanfic stories have been alternate-universe adventures of this sort. In this version of events, Luke Skywalker and Ben Kenobi arrive on Aalderaan before it gets blown up by the Death Star, and get blown up along with it. The book has been decried as bad—overdosing on technical details, and often getting details wrong. As one reviewer notes, “There is no ‘Star Fleet’ in Star Wars, that’s a Star Trek organization. The relevant equivalent here is the Imperial Navy.” And as fanfic goes, there’s nothing wrong with that either. Every fanfic writer has a right to write drek. It wouldn’t be fanfic without bad fanfic. But where we start to get off-kilter is that the book somehow ended up on Amazon.com. Yes, you heard me right. There is a work of bad Star Wars fanfic currently (as of this writing) available for sale on Amazon.com. And there you have it! She published on Amazon—but it’s okay, because only her friends know. (Well, and anyone who read their parish newsletter, but that’s neither here nor there.) Except…as it turns out, it’s not just on Amazon—you can actually find it all over the place by now. How many people work for WordTech? WordTech is composed of two individuals: Lori Jareo and Kevin Walzer. Lori manages the daily business and production operations, while Kevin manages the editorial selection process and book/web design. But let’s put that book on the backburner for the moment and look at another book-that-shouldn’t-be that’s also listed on Amazon. This is a book called Princess and Wolf, ostensibly written by Mercedes Lackey and published by Daw. It’s also listed at Powell’s, as well as dozens of other places just like Another Hope, above. This is a mystery. DAW books never published this. I certainly never wrote it. So far as we are concerned, it doesn’t exist. There are no pictures anywhere of the cover, so we can’t even tell if it’s someone else’s book listed under my name by mistake. I’m baffled, my agent is baffled, my publisher is baffled. We can’t get people to remove the listing because they all claim that the distributors “have a ton of them” in the warehouse. The book is a complete mystery. Googling on it turns up no pictures, no reviews, no useful information of any kind—just listings of it on various online bookstores. (If anyone out there happens to have bought a copy, please leave a comment here describing it?) There’s no way to tell whether it is a clerical error and the book does not actually exist, whether there’s a clerical error and somebody else’s book got mis-tagged with the wrong author’s name and publisher, whether something Misty really did write got tagged with the wrong title (highly unlikely), or whether someone else really is trying to publish their own work under Mercedes Lackey’s name. And then we have the Kafkaesque situation of booksellers unwilling to remove a listing for a book that they have already been informed the author did not write, because there are still plenty of copies of it left to sell. It’s also worth noting that Amazon has not yet removed Another Hope either (although they have edited the comments on the book down from about 30 critical of the author to just two that were critical of the work itself), even though they have had more than six months to notice that they were selling unlicensed fanfic. And there are other questionable books on Amazon as well. For example, even though Condé Nast is bringing legal action against Blackmask.com for the act of republishing the still-in-copyright The Shadow and Doc Savage novels, you can still find these books for sale on Amazon even now. And who knows what else you could find if you dug deep enough? But how does this sort of thing happen? How is it that Amazon, the biggest bookseller in the world, sells unlicensed fanfic and books of which their supposed author has never heard? How is it that these books are available in dozens of other online bookstores as well? WordTech uses print-on-demand technology for our books. Our printer is Lightning Source. “Print-on-demand” means that the book is printed in batches as small as one at a time on a digital press, instead of being part of a large offset press run. The quality is equivalent to standard printing, with glossy four-color covers and nice text paper. Our books are distributed through Ingram, the largest book distributor. Our printer, Lightning Source, is a subsidiary of Ingram, so all of our titles are automatically picked up by the Ingram database. This means they are available through Amazon, Barnes and Noble, Borders, and independent bookstores. A lot of small publishers are starting to use print-on-demand technology, as it is much more convenient for small print runs that don’t benefit from the economy of scale that lets the big mass-market publishers produce books so cheaply. And as Lightning Source is integrated with Ingram, the world’s largest book distributor, this means that a Lightning Source printed book is already halfway to hitting the shelves of every major bookstore and a lot of minor ones too. All that’s necessary is that it have an ISBN. The ISBN, or International Standard Book Number (not “ISBN number,” as that is redundant), is “a unique identifier for books, intended to be used commercially.” Each book has an ISBN number, and each ISBN number is (usually) used only for one book. An ISBN can be bought by anyone; the issuing agency doesn’t care whether the book is fanfic or not, or whether it’s written by who it says it’s written by. It just sells the number and the publisher can stick it on anything he wants with it. In the case of Princess and Wolf, that number is 5-558-60706-8. Each number is made up of a country or language code, a publisher code, an item number, and a checksum digit. In the case of Princess and Wolf, the country code, 5, means the work was published in the Russian Federation and ex-USSR. In order to find out who the actual publisher is, I would need access to the Publishers’ International ISBN Directory, which my local libraries do not carry. Regardless, it is necessary that a book have an ISBN before it can be stocked in most bookstores, including the major on-line ones. The corollary to this is, apparently in some cases an ISBN is all that’s necessary—if the book has an ISBN and Ingram is carrying it, onto the list it goes. Amazon carries a huge amount of books, and not just from big publishers either. As mentioned before, print-on-demand, Lightning Press, is used by a lot of small publishers, including self-publishing “vanity press” outfits. There are literally thousands of these books published every day, and the cost to list an individual book on Amazon’s website is very very low. So, if there’s even a chance a book might at some point be sold profitably, it’s in Amazon’s interest to list it—and thus, all these thousands of books are listed automatically, probably by doing an ISBN lookup against some database and importing the information it finds there into its store. And if the ISBN was tagged with faulty information when the work was originally published, that same faulty information will be imported into Amazon’s store, as well as every other bookstore that carries it. How long can Amazon (and other booksellers that use the same automated system, but Amazon is the most visible) continue to get away with this? Presumably Amazon will try to use the DMCA “safe harbor” provision, whereby they’ll be okay as long as they take down the offending material within ten days of receiving official legal notification, but does that really apply when they are selling a physical item, not just posting copyrighted information? And it’s worth noting that they responded to Mercedes Lackey’s request for removal of Princess and Wolf with a refusal due to existing inventory (though admittedly that wasn’t an official legal request). As for Another Hope, Lucasfilm has been informed of it by at least two or three different sources by now; according to this blog entry, Jareo’s website was replaced by a blurb stating the book would be removed from Books in Print as of Tuesday. When I try to view the site now, I find it has vanished altogether save for the Google Cache links I linked to early in this article. Some fanfic writers are worried that backlash over this published fanfic could result in a crackdown on fanfic in general, the end of the blind eye that many franchises choose to turn to writers who don’t get too big for their britches. However, I doubt that an isolated incident involving one very stupid person will result in consequences for anyone except for that person. We will simply have to wait and see. UPDATE: As one of the comments on this entry notes, the Amazon listing for Princess and Wolf has been updated in title to Princess and the Wolf and its author has been corrected to Karen Kay. 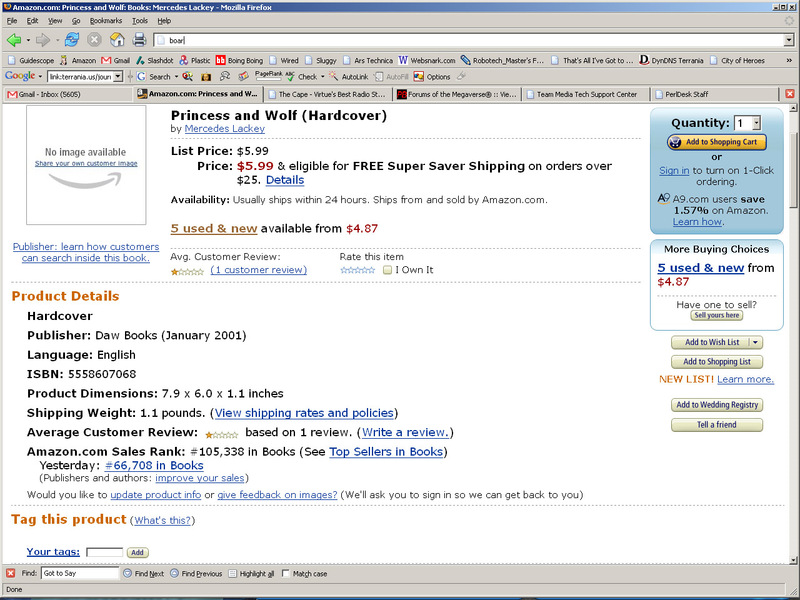 (Here’s a 359KB screenshot of the original appearance of Amazon’s listing, for posterity.) Apparently it is another edition of a historical romance novel that is listed elsewhere under its proper author and title. I had halfway expected that was what it would turn out to be. There is no indication as to why the book ended up in Mercedes Lackey’s name; we’ll probably never know. UPDATE (7/28/06): I have now written a follow-up entry wrapping up the Princess and Wolf affair.